When generating a flare specification it is important to detail the available utilities. All flares should be continuously purged to prevent oxygen ingress into the flare riser and fitted with continuous pilot burners to provide a reliable source of ignition. As such the purge and pilot gas supply should be from a reliable source. The composition of the available purge gas, the flare riser size and flared gas composition will determine the purge rate and this will be determined by the flare vendor. The pilot gas consumption will also be determined by the flare vendor and is also directly related to the flare size. Where smokeless combustion is required and cannot be achieved through the available energy/momentum of the flared gas stream, it will be necessary to use an assist medium such as air or steam. Steam is the most common medium and generally readily available on a refinery. 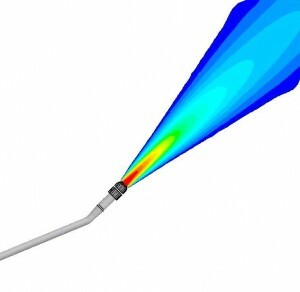 It is typically injected through numerous specially designed nozzles connected to a steam manifold attached to the flare tip. Air assist flares utilise a large volume of low pressure air generated by an air blower which is mixed with the gas at the tip. The location and elevation of the flare is a key design consideration determined largely by the allowable radiation. On onshore facilities the decision is frequently governed by its proximity to other process equipment, plant boundaries, prevailing wind direction and the cost of the associated support structure. Offshore the options are limited to platform mounted flare tower, bridge linked tower or flare boom. Recommended radiation design limits are provided in API 521. Site conditions such as wind direction, solar radiation, humidity etc. all have an affect on the exhibited radiation and therefore should also be communicated to the flare vendor during the design phase. Radiation shielding on offshore platforms is common place in order to further protect adjacent process plant and walkways. Water sprays have also been used.